A clean and well-organized workshop is a good way to get your job done quickly and with few frustrations. Most DIYers, professional electricians, and woodworkers will agree that a tool that can help you achieve that is a portable toolbox. In this post, we will show you 10 of the best portable tool box out there for you to chose from. We settled on the Keter New Masterloader because it sits at the Goldilocks of the best portable tool boxes. Apart from its sturdy and durable build quality, this toolbox come with ample space for storage of a variety of power tools. With industry experience that spans over 60 years, Keter Plastic is one of the most recognized brands when it comes to tools and home organization products. The company has even received the export award of Israel for a decade-long contribution to excellence. Therefore, if you are looking for a quality toolbox that will serve you for a long time, going with the Keter New Masterloader Plastic Tool Box is a solid choice. This toolbox features compartmentalized bins that maximize the interior space. The topmost bins are designed to slide apart revealing the main bin underneath. Therefore you get to store the most useful tools on top while the heavy tools go below. This toolbox is made of plastic but built for durability with a polypropylene construct. In fact, the material is designed to be resistant to most chemical agents making the toolbox a perfect fit for industrial work environments. For portability, the toolbox comes with a set of wheels attached not to mention a convenient locking mechanism that makes it ideal for travel. If you are a tool fanatic, getting all your equipment in order and well protected is simply a must. Stanley is another brand that takes tool storage, organization, and protection seriously. The company has been around for many decades with a strong reputation for producing reliability and quality in all its innovations. With that in mind, you can be sure the Stanley STST18613 is a solid pick. First of all, it comes with a lockable compartment that can be locked top to bottom with a standard padlock. For some DIYers, an aluminum build would be better but don’t let that discourage you. The plastic build quality is capable enough for heavy duty usage. you can use this tool box for storage of your power tools and other accessories and thanks to a 3 in 1 design, you can be sure of sufficient storage space. In terms of portability, the toolbox comes with large wheels and metal latches. However, there are a couple of complaints about the quality of the latches and the wheels. If you need a toolbox that can handle whatever you throw at it, trust Dewalt to come up with a top of the line quality. Yes, Dewalt is also an award-winning brand with a respectable history that spans over decades. Since 1922 the company has been developing woodworking machines, and electrical power tools that get the job done. 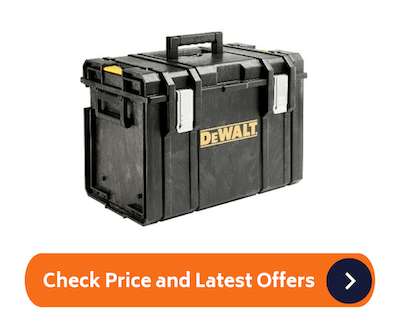 For that reason, the DEWALT DWST08204 is designed to be a go-to for DIYers looking for a modular storage solution that can be used for any job. The DEWALT DWST08204 comes with a portable design that features a tough trolley system that weighs up to 110lb. The entire toolbox is built with a durable material not to mention metal latches that are rust resistant. 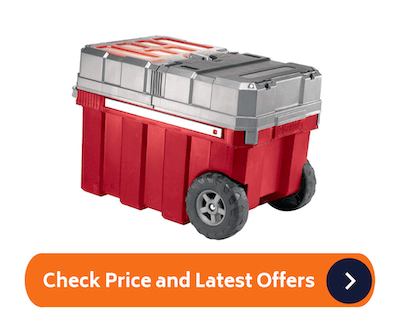 With an IP65 rating, this toolbox is water sealed and extra large for large storage needs. 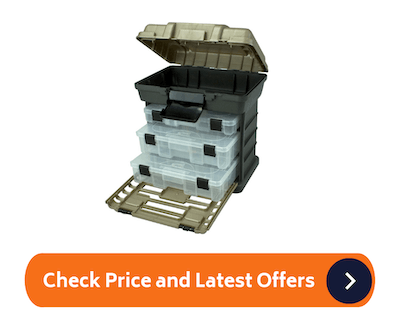 The side handles are also ideal for carrying and assembling products plus the inner vertical storage adds to the overall convenience that you receive. Whether you are a technician, a contractor or an electrician, the DEWALT DWST08204 brings about a combination of different features that make it convenient for any workshop. Beware however that some users have complained about brittle plastic parts that break off easily and a problem with the warranty. Sometimes all you need is a toolbox that will keep your hobby supplies safe and protected. 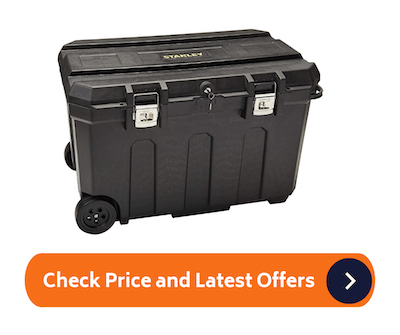 Well if that is the case, you will definitely love the Plano Molding 1363 Stow Toolbox. Besides, Plano Molding boasts of a long-standing history of making outdoor storage solutions with experience that spans over 6 decades. Inspired by natures simplicity, Plano Molding is known for coming up with storage solutions for archers, gun owners, and hunters. The Plano Molding 1363 Toolbox is by far one of their most popular products and for a good reason. It comes with partitioned store away trays that expand your storage space so that you get to store as much as you want. The quality craftsmanship also speaks for itself as the toolbox boasts of a quality plastic exterior with a graphite gray finish. The trays are designed to easily slide out making access to the compartments much easier. However, although the storage trays have permanent dividers separating them, some users have found that the dividers are not enough. Furthermore, others have complained of the weak door holds as well. However, considering the price of the Plano Molding 1363 Stow Toolbox, this can still be a decent option for a DIYer on a budget. Are you looking for a hobby chest for your tools? Well, with the Stanley 79-206 Rolling Workshop, you get exactly what you need at an affordable price and much more. The Stanley 79-206 Rolling Workshop is actually a portable workshop that you can use anywhere. It comes with a customizable storage option all thanks to a handle at the top and portable detachable containers that simply make it more convenient. In fact, the detachable toolbox at the top has a one hand operation latch not to mention 2 drawer storage units for a versatile organization. You can use this toolbox to various tools of various sizes and thanks to the aluminum telescopic back handle you can easily elevate the toolbox or lower it for perfect storage. This is a toolbox built to withstand any level of punishment as it is made with a durable build quality and an easy assembly. At this point, it’s starting to get clear that Stanley Tools is one of the best brands out there when it comes to quality tool boxes. Besides, the company boasts of close to 2 centuries of building reliable DIY tools that are used by professionals, as well as tool fanatics in America. With the Stanley 037025H, you can expect the same level of commitment to quality as with the other products form Stanley tools. In fact, the Stanley 037025H boasts of a unique portable design and it’s extremely well designed with collapsible handles that make it ideal for travel. Adding to its mobile design is a large pullout wide steel handle that has a soft grip to improve maneuverability. It’s a heavy duty tool box 50 gal capacity and a lockable nickel plated latches. If you live with any DIYers, you will agree that often, the tool mess gets out of hand. 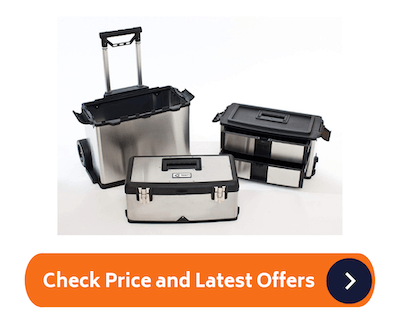 What better way to help them out than to get them a toolbox such as the Trinity 3-in-1 Stainless Steel Suitcase Toolbox to help them out. Well, this tools box comes with a great build quality that easily enables you to to get organized with your tools. The toolbox comes with two separate compartments that also easily accessible for your own convenience. The entire toolbox is made of a durable stainless steel and you can use it for art supplies, crafting supplies and even model building tools. The metal build is rust resistant and to enable easy maneuverability, the toolbox comes with rubber wheels and handle. There are multiple storage compartments including a removable tray and middle section with 2 separate drawers making this the ideal traveling toolbox. Best Choice Product was an idea birthed by two friends in a garage back in 2002. The vision behind the brand was to come up with a range of products that deliver incredible value without any extra costs. Currently, the company has a track record of delivering high-quality family-friendly products ranging from dining sets to living room furniture and storage solutions such as the SKY2521 Portable top chest Rolling Storage Box. 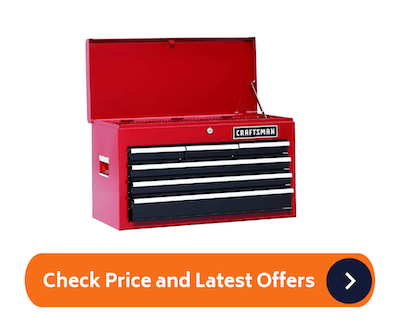 With a durable steel construct, this toolbox brings you top of the line build quality. The overall construct is designed to last and with the 10 storage compartments, you get more than enough storage space for your tools. The stackable design allows you to separate the tool chest from the storage cabinet or stack them together depending on how you like it. Although it comes with four wheels, you can easily remove them to have the toolbox sit flat and steady in your workshop. Looking at the user reviews, there are some complaints about distorted metal parts, however, a good number of users love its quality and price. Once again, Dewalt takes another spot on our list of the best portable tool boxes and for a good reason. It features a flexible design gives you different combinations such that all the units can stack on top of each other conveniently. Furthermore, with the durable side latches, you can connect each compartment and carry the entire toolbox easily and safely. For extra accessibility, there is a removable interior tray included in the toolbox and the bi-material handle makes it easy to lift when need be. From storing your tools (both corded and cordless) to keeping your workshop tidy, this toolbox can do it all. The only downside is that it does not come with wheels and that its drawers are not lockable. This can be a deal breaker for those looking for a lockable toolbox that offers easy maneuverability. Craftsman has been around since 1927. That alone tells you just how much industry experience this manufacturer has in the making of top-tier products. The company claims to spend hours of craftsmanship just to come up with tool storage solutions that work for its customers. Built on top of America’s iconic values of hard work, it is clear to see this dedication to quality on the Craftsman 6 Drawer Heavy Duty Top Tool Chest. This toolbox is designed to fit your storage needs especially with its 26 in 6 drawers heavy duty design. You can use different sized drawers to store a variety of tools making it the ideal toolbox for DIYers and professional with a collection of different tools. In case you have bulky tools, you can take advantage of the top storage space. It also comes with side handles that enable easy maneuverability and the lockable design is quite appealing for keeping tools secure. The only downside is that there are some complaints from some users about the toolbox not being square enough. This can be an issue for those looking for a stackable toolbox. If you find your workshop untidy and disorganized, it’s a clear sign that its time to get your hands on a decent toolbox. Getting a portable one that allows you to move around with it easily is a plus. However, how do you identify one that works for your needs? Well first let’s take a look at the different type of storage tool solutions you should have in mind. First of all, you can get a cabinet tool box with rolling wheels. Although most of these are designed to remain stationary in the workshop, they come with wheels that enable portability and maneuverability around the works shop. If you need to take your toolbox to your workplace, you can get the smaller one that comes with a handle at the top. 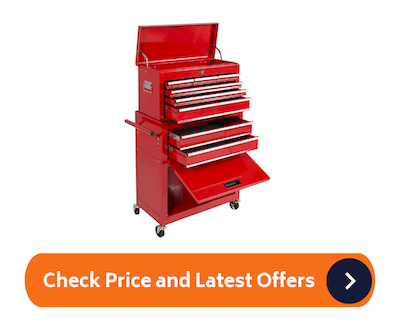 You can also settle for a tool chest with a stackable toolbox that is typically larger with ample storage and a pair of wheels for maneuverability. Is a portable toolbox important? Well, it depends on your own preferences. The best portable toolboxes come with a variety of features that make them a necessity especially if you are a DIYer or professional technician or woodworker. Besides a well built portable toolbox can last for decades. If you are an avid DIYer, the overall benefit of portable toolbox can outweigh its price especially if the toolbox has sufficient storage. A toolbox also provides safety for your tools so that you won’t have to buy new tools as a result of theft or misplacement of the tools. With that out of the way, let’s take a look at some of the important features to consider before a purchase. Without a doubt, one of the most distinguishable features about toolboxes is their design. Some have a stackable design that is easy to assemble, with an extra tool chest attached for more storage options. 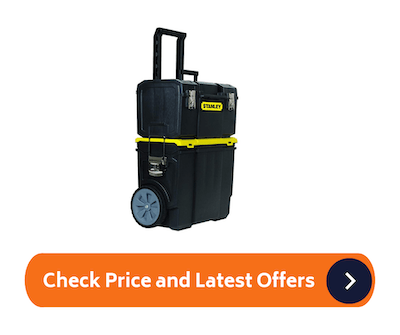 You can also go with a water or chemical resistant design that lets you use the toolbox in the most hash work environment without worrying about damaging your toolbox. Other design features such multiple compartments make organization of your tools much simpler. You can have your heavy tools at the bottom with the smaller ones at the top depending on the design of the toolbox. 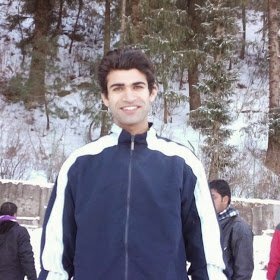 Another feature that you need to pay attention to is durability. 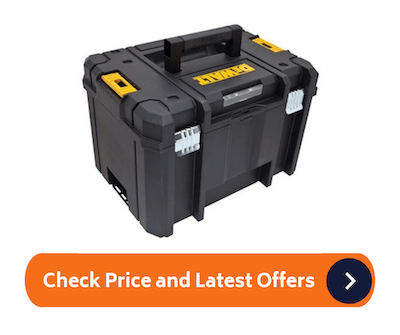 You can easily confirm the durability of a toolbox by looking at the user reviews to see what other users are saying about that particular toolbox. You can also check out the material that the toolbox is made to determine its durability. Even though some options are made of metal, they tend to be made out of cheap metal that deforms easily. Also, don’t overlook a toolbox made of plastic. In fact, some of the most durable tool boxes are made out of top quality plastic that is also resistant to erosive chemicals. You better check out the specification of the toolbox before making a purchase. Even though some options feature a steel body, you would be surprised to find out that they are only plated to resist corrosion. As a result, such toolboxes tend to rust easily especially when put through the paces. If the toolbox is made of cheap plastic, it can easily crack especially when exposed to extreme weather conditions. To be on the safe side go with a premium priced toolbox that has a warranty to ensure quality build material. You need a toolbox that is easy to assemble while giving you easy access to your tools when you need them. One of the things you have to avoid is tool boxes with plastic latches as the latches break easily. Some toolboxes come with a modular design that makes it easy to assemble the parts you need so that you can have a travel-friendly toolbox. Also, check to see whether it has a handle with a decent grip. We recommend you go with a toolbox that has a well built telescopic handle with rubber wheels and a multilevel design. Well, there you have it, folks. You now have a variety to pick from while looking for a reliable storage solution for your tools. And with our buyer’s guide, you can be sure to make the right decision by picking a portable toolbox that has the right features for your needs. A good number of the items on our list are pretty affordable and boast of quality construct that will last years.